Clearly Natural Vitamin E Glycerin Bar Soap is a transparent bar that provides gentle all-over cleansing for face, hands and body. Clearly Natural Vitamin E Glycerin Bar Soap mild, all-vegetable formula is ideal for all skin types. Clearly Natural Vitamin E Glycerin Bar Soap has a high glycerine content of 27%. Clearly Natural Vitamin E Glycerin Bar Soap is non drying and will not leave skin dry or itchy. Clearly Natural Vitamin E Glycerin Bar Soap rinses off easily and leaves no sticky film on your skin or your tub. 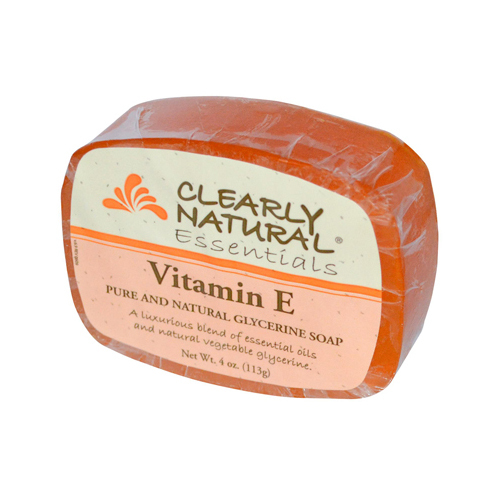 Clearly Natural Vitamin E Glycerin Bar Soap is an all-vegetable formula with no pore-clogging animal ingredients. Clearly Natural Vitamin E Glycerin Bar Soap is hypo-allergenic and dermatologist recommended. Clearly Natural Vitamin E Glycerin Bar Soap is biodegradable � from making it to using it, Clearly Natural Vitamin E Glycerin Bar Soap doesnt harm the environment. Clearly Natural Vitamin E Glycerin Bar Soap comes in an attractive, transparent style. Clearly Natural Vitamin E Glycerin Bar Soap is hypo-allergenic and cruelty free. Enriched with natural vegetable glycerine, Clearly Natural Soap leaves your skin clean, refreshed, and naturally moisturized. Clearly Natural uses a natural base of vegetable derived cleansers, vegetable glycerin, saponified vegetable oils, and natural essential oils and fragrances. Vegetable glycerin is a natural humectant that draws moisture to the skin, keeping it fresh, soft and moist, even in the driest climates Saponified is the traditional way of making soap from vegetable oil. Clearly Natural strives to provide honest, pure and natural products to their customers and will label any newly formulated products as NEW, so you will know when they have made a change. Youll also feel good knowing that most Clearly Natural products are 100% natural, and that all Clearly Natural products are cruelty free. Clearly Natural never tests their products (or their ingredients) on animals. Free Of Animal ingredients or by-products, parabens, preservatives, or petroleum-based ingredients. Disclaimer These statements have not been evaluated by the FDA. These products are not intended to diagnose, treat, cure, or prevent any disease. Ingredients: Glycerine (palm), palm stearic acid, palm oleic acid, sodium laural sulfate(manufactured in California with corn alcohols no preservatives orfamaldahides), sodium hydroxide, purified water. (If specified: naturalfragrances, essences, natural colors (betacaritine and cloriphyls), vitamin E,aloe vera and jojoba oil.